One of the few Champagnes elaborated by “Saignée”. One of the few Champagnes elaborated by “saignée”, from Pinot Noir grapes exclusively. An art that Jean-Baptiste Geoffroy masters following the lead of many champagne generations in this family. After a few hours of maceration, the wine turns into a ruby red and this Champagne master then stops the macerating process, which takes an outstanding expertise. The colour is a bright ruby red. 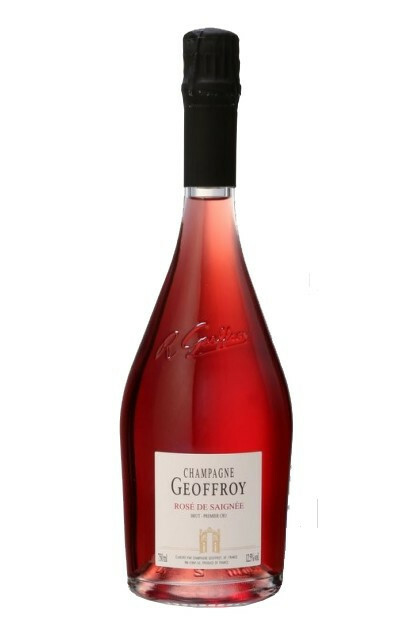 The nose is a freshly cut spring bouquet : rose, peony… then wild strawberry, raspberry and as a last touch, blackberry. The taste is a reflect of the nose’s fragrances : red berries. A lasting impression on a peach soup with marrat or gariguette strawberries, even better with wild strawberries. Will also go well with pan-fried scallops or sole meunière. To be kept one or two years in cellar, in order to preserve this champagne’s youth and its red fruit aromas. The René Geoffroy House, whose roots in Cumière in the Champagne region date back to the 17th century, at the beginning of the 1600s. It is located in the heart of the famous village of Aÿ, who gave its name to its wines, that later became “Champagne” at the end of the 19th century. Since then, the vineyard has been perpetuated from generation to generation, by transmitting the lands and invaluable knowledge. This House is completely family-owned and only sells champagne from its vineyards whose surface area amounts to 14 hectares, located on the great hillsides of Cumières and Hautvillers for the main part. The grape varieties are 42% Pinot Noir, 39% Pinot Meunier and 19% Chardonnay, thus allowing for a wide range of possible blends between the wines composed of those three Champagne varieties. The most ancient plot was planted in 1926, almost 100 years ago, and the vine are on average 20 years old. The soils are either chalky for Chardonnay, or clay-limestone for Pinot Meunier, and siliceous clay for Pinot Noir. The wine is matured in part in oak barrels then aged in bottle in the House’s deep cellars (15 metres). Production amounts to 120.000 bottles every year.